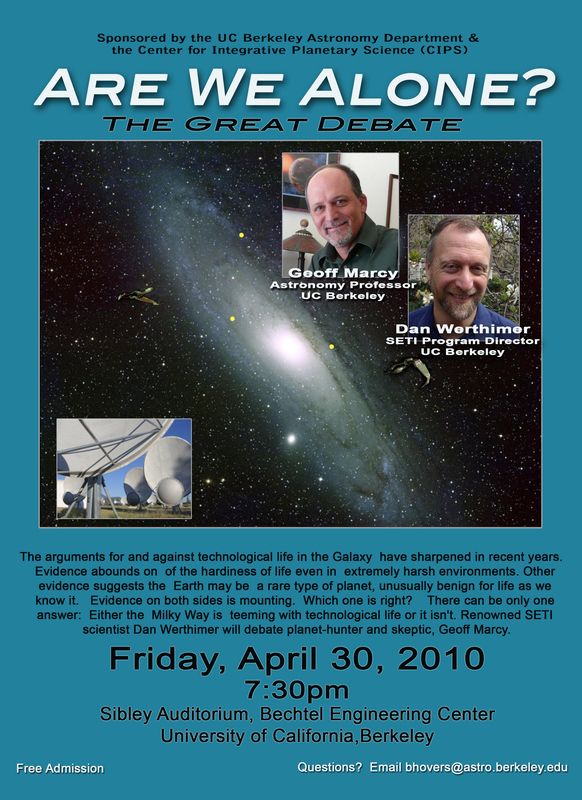 Planet-hunter Geoff Marcy and SETI scientist Dan Werthimer will be having a public debate about the existence of technological life in the universe on Friday, April 30, 2010 (7:30pm) at UC Berkeley. Free admission. Click here for more information. Update: This will be streamed live. When exactly? It depends where you are. Message 979131 - Posted: 15 Mar 2010, 21:26:08 UTC - in response to Message 979038. Planet-hunter Geoff Marcy and SETI scientist Dan Werthimer will be having a public debate about the existence of technological life in the universe on Friday, April 30, 2010 (7:30pm) at UC Berkeley. Will this be streamed or, better yet, be recorded (audio or video) for later download? Sometimes I think we are alone in the universe, and sometimes I think we are not. In either case the idea is quite staggering. Would be awesome with a recording. Message 983419 - Posted: 25 Mar 2010, 5:52:23 UTC - in response to Message 979425. Message 983897 - Posted: 26 Mar 2010, 12:18:20 UTC - in response to Message 979038. I want to know whether do seti have found some important find? As far as I know they haven't as yet. 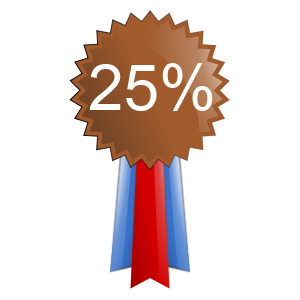 But as I understand it, Nitpicker will be re-examining the most promising results from the data collected. @Andrew - thanks for the heads up there, look forward to further info. 50 years of SETI - no signs of life out there. What a waste of time. If we are alone, it will be an awful waste of space. Message 985190 - Posted: 30 Mar 2010, 0:42:28 UTC - in response to Message 985015. If there were no other intelligent life in the near infinity of space, then we should not be here either!!! That would mean that the marvels of the cosmos would be irrelevant with no intelligence to observe it. Maybe the "creator" realised this and made sure that life could come about to appreciate his works? Even if we do find a message from the beyond, conversation is going to be somewhat difficult with a time-lag delay each way of at the very least 10 light years!! That's within the Milky Way Galaxy. Outside the Milky Way we are looking at a 20,000 year wait for an answer to any question sent to the next nearest galaxy!!! Message 985443 - Posted: 30 Mar 2010, 23:02:14 UTC - in response to Message 985321. Much, much longer: we’re something like 30,000 LY from the centre of our own Galaxy. The nearest large galaxy to us, M31 in Andromeda, is over two million LY away; IIRC even the Magellanic Clouds, small galaxies that the Milky Way is in the process of chewing up, are about 150,000 LY from here. Message 987478 - Posted: 8 Apr 2010, 11:57:01 UTC - in response to Message 983911. Message 988560 - Posted: 12 Apr 2010, 5:18:51 UTC - in response to Message 985015. Actually SETI is looking for Intelligence, "life" has already been proven to exist in the form of bacteria. Obviously you're having trouble exhibiting what they are looking for. Message 988575 - Posted: 12 Apr 2010, 6:32:02 UTC - in response to Message 985443. Thanks for correcting my time/distances. 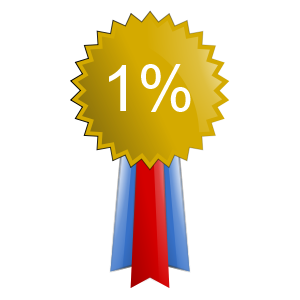 I new that my figures were "at least" those i quoted, but had not delved that deeply when compiling my message. Your revelation makes my observation that it is even more improbable, although I do not think there can be anything less probable than infinitely improbable!!! So, following on the "creator" supposition, it seems we have to conclude that we are denied any contact with other intelligences (outside the Milky Way Galaxy anyway), as they will not have evolved to that stage by the time any message might reach us, and it seems that we are certain not to be able to marvel at any other intelligence, but only to ponder on our own development, and reluctantly being forced to conclude that the end of the Solar System may well precede the arrival of any message from elsewhere reaching us at the speed of light!!! All the intelligences may well be concurrently doing their own SETI thing, but by the time that all the messages start reaching any suitable destinations, the sending intelligence will have ceased to exist!!! It will also be ironic that any message received, will be certain to be from a source that has long since ceased to exist!!! Maybe our SETI task is comparable to a making a forlorn search for an ancient Egyptian Pharaoh still being alive today in order to have two way conversation!!! But let's keep trying. Message 988594 - Posted: 12 Apr 2010, 9:19:33 UTC - in response to Message 987481. That's wrong. Theres no space ship in/on the moon. However there is a many many thousands of years old genetic laboratory inside a crater, on the far side of the moon. Totally off topic, yet not. But am I alone in having einstein@home not work. 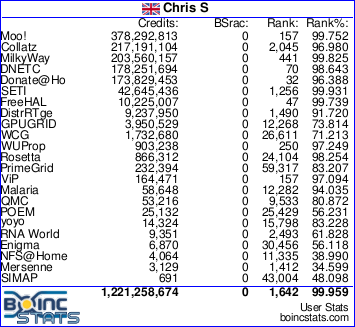 I keep getting an error about the graphic screensaver, and this shuts down my Boinc until it changes projects. I know this is SETI site, and I will re-post on their board too, I was just curious if there were more experienced people who have also had a problem w/einstein?